You're likely not in my demographic if you're on the hunt for a classic yacht to restore - it's not so much a questions of money (though I have none) - as it is one of the luxury of free time (I have none) and a patience and purpose (again, none) to labor at the service of a dream that may never come to pass. Such is the standard formula for a classic yacht love affair, in many ways not all that different from the human variety. But what do I know? I'm only a married-with-two-little-kids and a dream sucking corporate-desk-job slob. 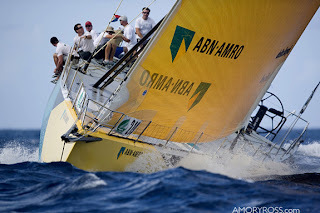 I'm not the throw-it-all-away to render beauty and classicism real type yachtsman. Take a look here at the 72' Rhodes-designed "Escapade." She's ripe for a lover with grand vision and deep pockets. Perhaps one of you will woo her? There's something ineffable about watching a classic yacht under sail. It scratches a place deep down in me that nothing else can seem to reach. That's a love affair, truly. Hurts so good. I completed management training today despite the spring snowstorm that's whacked the Northeast U.S. and though I learned a great deal through the week and appreciate the opportunity, I'll be glad to be back to my regular program. Sitting in a class eight hours a day is no fun at all if you're not accessing the pressure relieving "extracurricular" activities we enjoyed as college students. 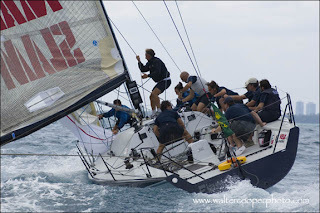 Which brings me to the topic of this post...earlier in the week I had written about the unsung role of the grinder in the context of the larger team on a racing yacht. 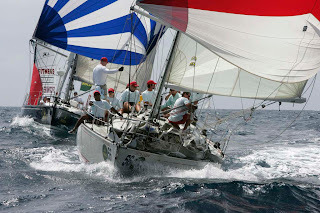 I noted at the time that the lessons one learns as part of the crew on a big sailboat have more than a few similarities with the things I was being taught during the management courses. The post spurred a lively conversation between Tillerman and Carol Anne, the gist of which you can read here. They both make good points and I have to agree that if I was learning these management lessons aboard a sailboat - as opposed to spending eight hours in the classroom - not only would I be personally thrilled...but I think that my fellow students (once past their fear of tipping over on heel) might actually get more from the material. Does anyone know of organizations that do this sort of corporate training? Sounds like a tremendous business opportunity. As regular readers know, my folks have been cruising this past winter in the Caribbean Islands aboard their 46' Morris sloop. I just received an update via satellite email and am posting it below. It was 10 degrees this AM in the Northeast U.S. 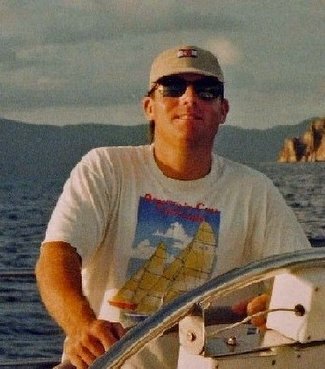 Though I spent many years living and sailing in the islands through the mid to late 1990's...I sure could use a dose of it now! will be able to enjoy that too. 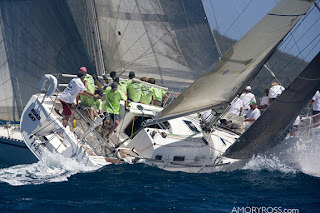 It was fun to be at anchor surrounded by 300 plus racing boats all with flags flying in the breeze - very festive! Since I last wrote, as we were leaving Dominica and Guadalupe, we have also visited both St. Kitts and Nevis as well as Antigua again. We have had some adventures. We dragged twice while we were off the boat and when rescued by some very nice people were on the way to Panama. Needless to say we now not only back our anchor in, but also swim over it with a mask to make sure that all is well. We have met some nice people. The English couple who rescued our boat the first time have become sailing buddies and have introduced us to other friends of theirs. We all spent 5 days waiting for a weather window in a lovely cove on St. Kitts where the sheep and cows grazed all over the hillside and the snorkeling was good. The fourth boat in the cove turned out to be an 80 year old Hungarian/American and his 72 year old wife who have made this trip from their home in Falmouth, Mass. for the last four years - amazing!! birthday present) and then we will begin to provision the boat for the trip home. We have 3 other men coming down to help us with the trip back. We are allowing two weeks for the return trip so hope to be picking up our mooring in Maryland by the end of April. As a cruiser/sailing enthusiast who blogs about boats and sailing, you might be interested in another sailing blog by Bruce and Jan Smith, who are sailing to the Caribbean aboard their hand-built 34-ft. gaff-rigged ketch, Woodwind. They started the journey from their home in Gig Harbor, Washington, last summer and are now on the northern coast of the Dominican Republic. Along the way, they’re keeping their friends, family and fellow cruisers updated on their adventures with their Web site and blog. Speaking of adventures, you might have seen the news story about the two American cruisers who rescued some Haitian migrants last week, after their boat had caught fire and blown up at sea. Bruce and Jan Smith are the two Americans! They tell the story of the tragic event and emotional rescue on their blog, including some photos. It’s really an amazing and heroic story, and ponders a question every cruiser has probably thought about at one time or another … with the threat of piracy and other dangers when sailing miles offshore, would you risk your own safety to save someone else? The Smiths’ story provides food for thought. Hope you find it interesting! Posted by Mike Bernstein of Bahama Breeze for Bruce and Jan Smith, who are currently anchored off Santa Barbera De Samana, Dominican Republic. Since a visit - nearly two years ago - to Charleston, SC for a wedding I've been interested in and posted on the lowcountry sailing scene. South Carolina is a sailors mecca, allbeit not as high profile as Newport or Annapolis...and so it's with great pleasure that I point to news of Sunday's launch of South Carolina’s only tall ship - a 142-ton, wooden schooner aptly named "Spirit of South Carolina." The project is sponsored by the South Carolina Maritime Heritage Foundation which is itself the repository of a wealth of SC Maritime history. According to SCMHF, the Spirit of South Carolina is a pilot schooner reminiscent of the Frances Elizabeth, a vessel that was originally built by the Samuel J. Pregnall & Bros. Shipyard in Charleston in 1879 and served pilots in this city's harbor for 25 years. Plans for the Frances Elizabeth, from which the new ship has been adapted, were found at the Smithsonian Institution within that organization's extensive collection. I'm no Kevin Costner fan but I took a chance the other night, fortified by a good bottle of red wine from Washington State (2002 Stella Maris) and slapped "The Guardian" on the tube. For those unfamiliar, the movie - billed as "Top Gun" meets "An Officer and A Gentleman" for the U.S. Coast Guard - is about a long time rescue swimmer Ben Randall and his upstart successor, played by Ashton Kutcher. The ocean rescue scenes were very cool...though I don't recall any that stood out involving a sailboat...but the plot was a real snoozer. Even hotty Melissa Sagemiller struggled but ultimately failed to "rescue" it. I'm sure I'm not alone when I wonder aloud...how come nobody can make a modern sailing/seagoing movie (Master and Commander, Captain Ron & Dead Calm excluded) worth a damn? I mean "Wind" was abysmal (1992 w/ Matthew Modine). Is it just that sailing doesn't translate to film? Or maybe it's so niche that good film makers aren't attracted to the topic? Or maybe I'm wrong...it's happened before. 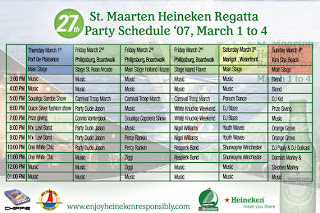 The 27th Heineken St. Maarten Begins!